We use a lot of vanilla extract: yogurt, smoothies, oatmeal, hot fudge, etc. We usually purchase a large bottle (at least 4 ounces and more if we can find one) but find the cost high so we’ve decided to try our hand at making our own. 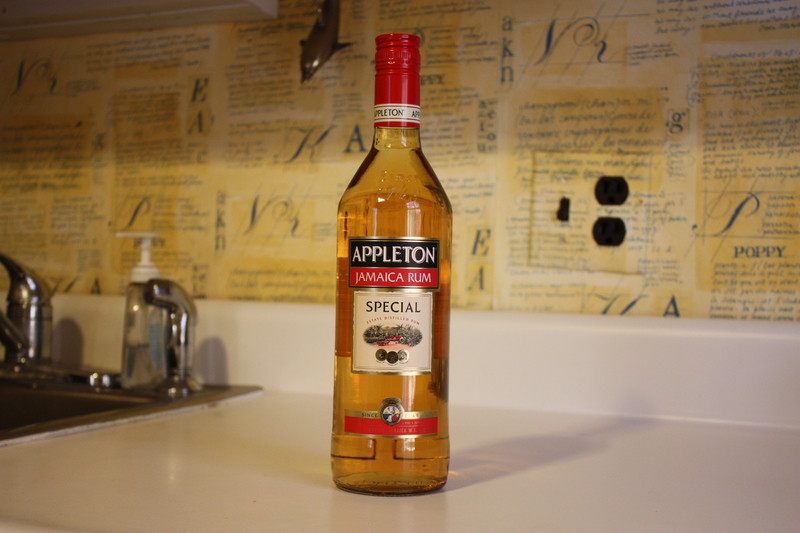 I had been reading this article which suggested using Appleton Estate rum. I had always assumed that vodka was the liquor of choice when making vanilla extract but after doing a little research I am willing to give rum a trial run. 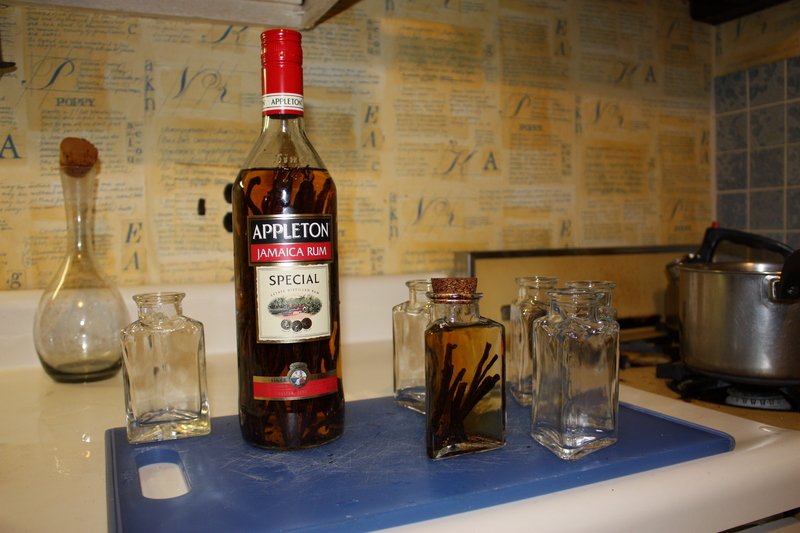 So I bought a bottle (750 ml) of Appleton Estate rum which should make approximately 3 eight-ounce bottles of vanilla. I ordered a half pound (more than 50 beans) of grade B vanilla beans for $19.49 from Amazon.com which came with a free pack of 10 Tahitian Grade B beans. The beans arrived in a few days. My research led me to the fact that grade B beans are perfect for making extract because they’re dryer than grade A beans. We used the rum bottle and one small bottle in which to steep the beans. First, we sterilized our jars and lids by pouring boiling water over them and then letting them soak in the scalding bath for about 10 minutes. I located some 8 less than 4 ounce bottles at Michael’s in which to put the extract to present as gifts. I’m on the lookout for the perfect bottle to use at home. 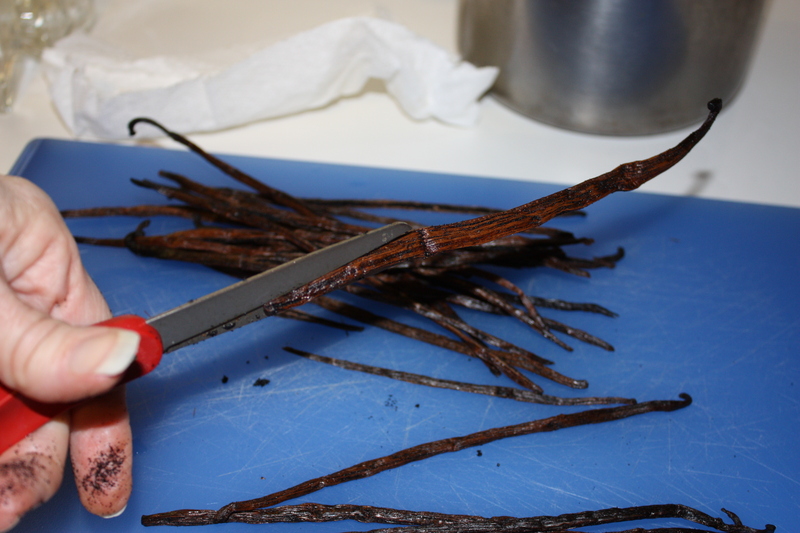 Next, with a sharp pair of kitchen scissors or paring knife, cut the vanilla beans in half, leaving an inch at the end connected. Put the beans in the bottle and cover with liquor of choice. Most recipes say 3 beans to a cup (8 ounces) of spirits so to make double vanilla extract we added 6 beans (18 for the entire 750 ml bottle). 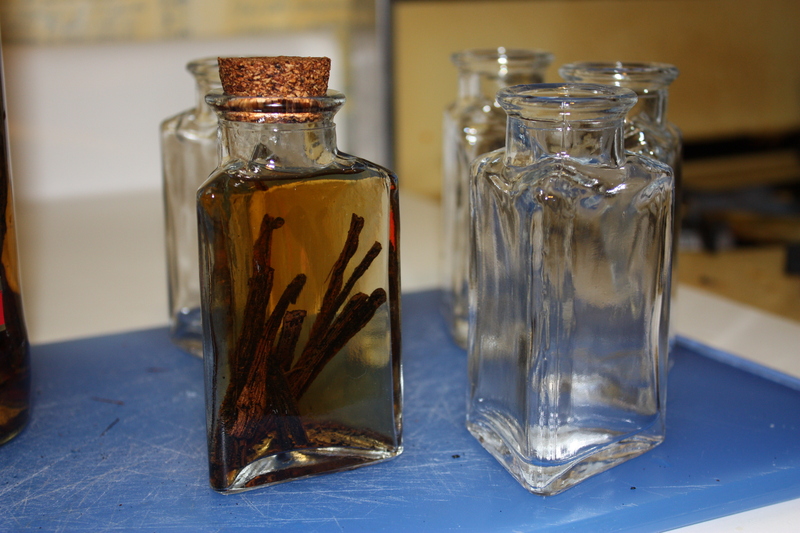 Vanilla beans and liquor make vanilla extract - it's that easy! Now we’ll just let it sit for at least a month, 2 are better. Every so often we could give it a shake to mix the infusion. 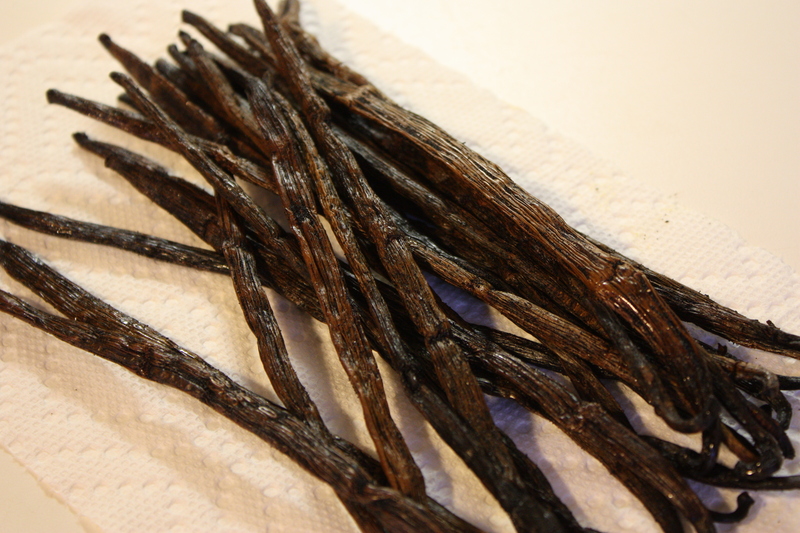 We have lots of beans left to make other vanilla items: sugar, tea, coffee and more extract if this is a hit. Have you made anything for the first time? Did it turn out great? Or need a few tweaks?